Did you know not all humic substances are alike? The category of “humic substances” represents a large variety of humic compounds with very different properties. Some humics are beneficial; others have little or no benefit to plants. Did you know that most states don’t require manufactures of fertilizers and soil amendments to tell you which kinds of humic substances are inside their products? Don’t be fooled into purchasing humic-based products that don’t work! Learning the basic science behind humic substances will give you the tools you need to understand which humic-based products have the most value. Humic substances are the organic components of soils. Humics are comprised of phenols, lignins, lipids, sugars, esters, quinones and other mild organic acids. They are essentially the biodegraded remains of plant matter due to microbial activity. Humic substances represent the furthest state of decomposition of organic material in the soil. Where do Humic Substances Come From? Humic substances come from composting vegetation, peat bogs, manure, and sapropels (organically rich sediments found at the bottom of a river, lake, or marine water body). These humics are considered “short-term processed humics” because the amount of time it takes to biodegrade vegetative tissues in these environments is relatively short (only a few months to a few thousand years). Humic substances can also be found in much higher concentrations in lignite, leondardite, and brown coal. These humics are considered “long term processed humics” because the biodegradation process typically takes place over millions of years. Long term processing of humic substances is enhanced by heat and pressure. How are Humic Substances Processed? Before humic substances can be applied to the soil, they must first be extracted and purified. Humics may be processed one of two ways: chemically or biologically. Most humic substances are chemically extracted from lignite or leonardite ore via a series of acid and base reactions. The end product is very pure, but the use of caustic chemical reagents makes this process environmentally unfriendly. Chemically processed humics substances typically have a moderately high pH (9-10 avg). Conversely, biologically processed humic substances are extracted using common soil microbes. With this method, plant material is broken down in a series of biological reactors in a controlled, industrial environment. Biologically processed humic is an environmentally friendly process and has the added benefit of generating a product with a near neutral pH. Which Kinds of Humic Substances are Beneficial? When it comes to humic substances, molecule size and solubility are the two largest factors that determine how beneficial humics are to plants. A typical fraction of humic substances found in nature is divided into 3 components: fulvic acids, humic acids, and humins. These compounds are listed in order of molecular size from smallest to largest (see Figure 1). In general, fulvic acids are the most biologically active and beneficial to plants. Smaller size humic substances (such as fulvic acids) tend to be more soluble and lighter in color. Fulvic acids have one more benefit over humic acids and humins; they are soluble in both acidic and alkaline soils. Humic acids are almost as beneficial as fulvic acids except they slightly larger in size, darker in color, and only soluble in alkaline soils. Humins have the largest molecular size of all humic substances. Unfortunately, they provide little value as a soil amendment. 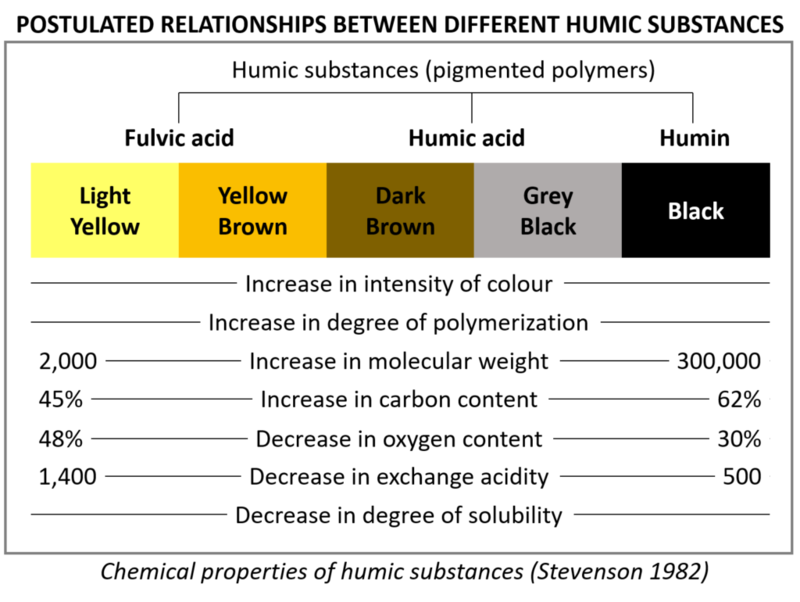 Humins are extremely dark, have a thick mud-like texture in water, and are completely insoluble at any pH (see Figure 2). How Do Fulvic Acids and Humic Acids Benefit Plants? Studies have shown that when plant roots are in contact with humic substances, those roots grow faster and become more developed. In general, humic substances promote more root cores per plant, and more lateral root hairs per root core. Turf that has a well-developed root system is better able to 1.) Absorb water and nutrients from the soil and 2.) Withstand the stress of root-feeding insects and physical agitation (i.e. foot-traffic). Micronutrient minerals in the soil (such as iron, magnesium, copper, zinc, and manganese) play numerous critical roles in the metabolism of all plants. Without them, plants couldn’t photosynthesize, respire, or produce metabolites necessary for survival. Humic substances can chelate (grab and temporarily hold) metal ions in the soil. When a root encounters a chelated metal ion, the humic substance releases its hold and the ion is absorbed by the root. Some humic substances can hold more metal ions per unit area than others; this means they have a higher cation exchange capacity, or CEC. Sandy soils have very low CEC, which means macro and micronutrients tend to leach quickly from soils. If adding a micronutrient mix to your soil, also consider adding humic substances to reduce leaching potential and increase micronutrient uptake. Figure 4 is the structure of a typical fulvic acid molecule. Note how fulvic acid works like a “glue” to chelate various kinds of metal ions (micronutrients) in the soil. Most humic substances transfer their metal ions when they adsorb against a root, however some fulvic acids molecules are so small, they can be absorbed by the plant root entirely with the metal ion still chelated. Of all the stresses terrestrial plants face in an average year, none is more prevalent that drought stress. Without water, plant life is not possible. Water drives the circulatory system of plants; everything from macro & micronutrients to salts, sugars, and metabolites are either dissolved or suspended in water. In times of drought, plants deploy several defensive strategies, however if a plant can’t access enough water to drive its circulatory system, it desiccates and dies. Lower molecular weight humic substances act like a sponge in the soil. Fulvic and humic acids are very soluble; an average size humic acid molecule can hold up to eight times its weight in water! Humic substances help mitigate the effects of drought by retaining more water in the soil. More water means a greener, healthier turf, particularly in the harsh summer months.